Our spot on Easy Street. 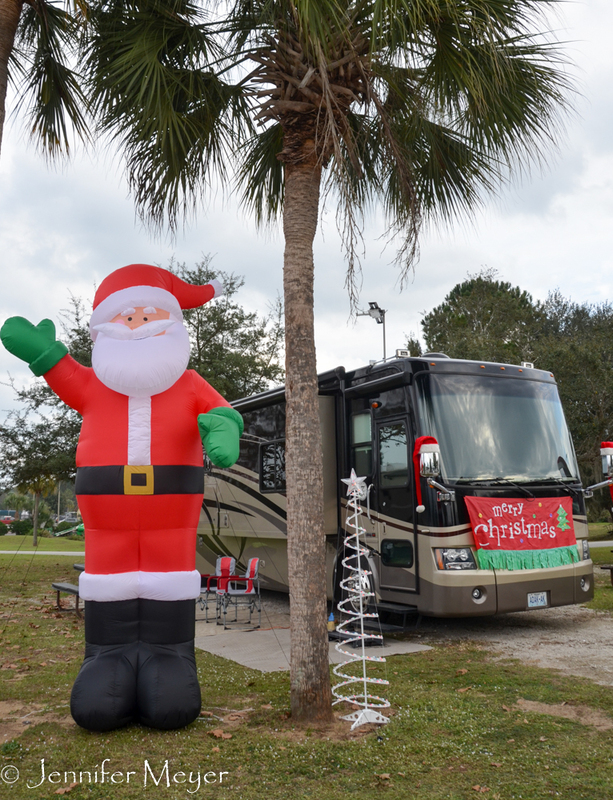 We planned on spending most of the winter in Florida, and we were warned to get reservations early. Our Thousand Trails membership allows us to stay up to two weeks in a park, then we have to be out for a week. 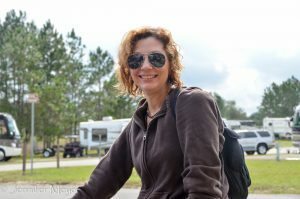 There are three Thousand Trails parks in Florida, so we reserved two weeks in each of them, a week apart. 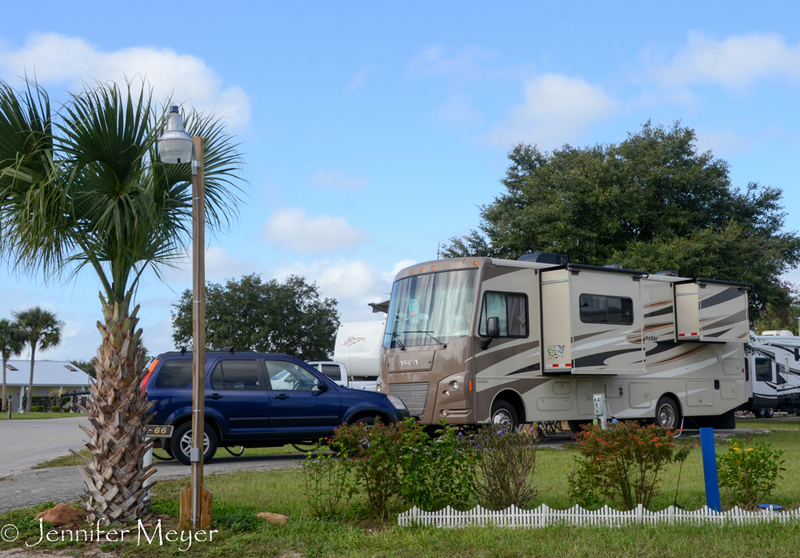 The first park we chose was Orlando RV Resort, and I think this one is the Ritz of all Thousand Trails parks. It’s huge: over 800 sites. And it has all the amenities and more. The place was in great shape, and all the workers were full of smiles. We’d never stayed anywhere as long as two weeks, but we were happy to settle into this well-kept place. Us with Julie and Marc. 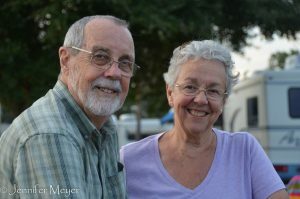 We arrived at the park in the dark, but our friends, Marc and Julie, were already there and they directed us to a perfect site on Easy Street that was close to them and invited us to dinner once we were set up. (What a treat!) 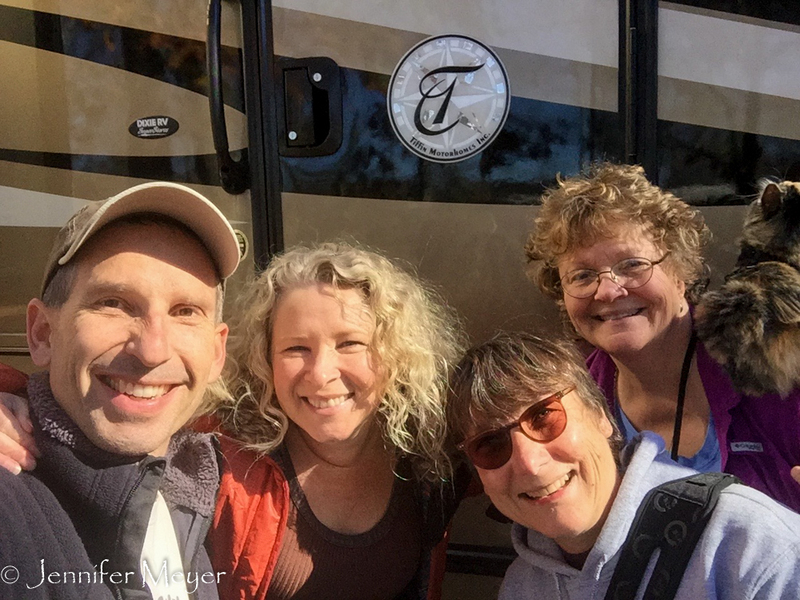 We’d met these friends at Circle M Park in Pennsylvania and connected again in North Carolina. We really enjoy them, and it made such a difference having people in the neighborhood we know. We had them over to dinner a few nights later, and we saw lots of them during our stay. We had another friend here at the park: Andrea. We’d met Andrea at the national park campground in Washington D.C. when she was just starting out on her solo adventure living in an RV. We were so excited to see each other again. Andrea was up for playing some of the many games the park offered, and just hanging out talking about life. We had her to dinner one night, too, and it’s so fun to entertain friends again. We also met new friends, Dee and Michael, who moved to Canada from Zimbabwe in the late 70s. They’ve been full-timing it in an RV for several years now, and they had us over to dinner one night with Marc, Julie and another couple. 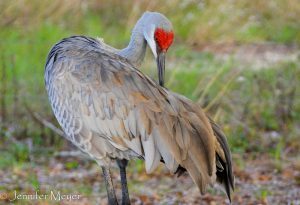 We look forward to meeting up with all of these friends again in the other Florida parks. It makes such a difference, in this transient life of ours, to have familiar faces around us from time to time. 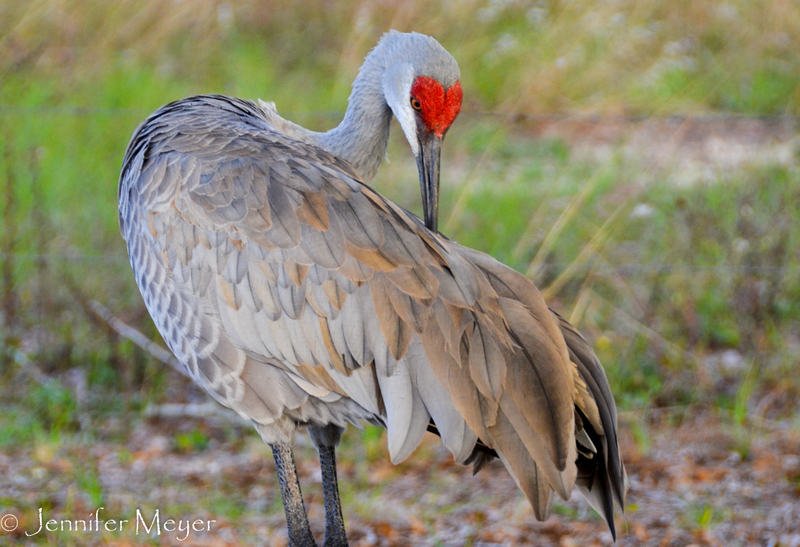 Our site was near a large, open field that was frequented by sand hill cranes. These are huge, beautiful birds, and they were none too shy of humans. The first time they walked through our site, Gypsy lay flat on her belly in terror, but after a few days, she would creep forward in a stalk, sure she could take one down. Gypsy had a similar relationship with a squirrel that lived in the tree next to us. They were about the same size, and although Gypsy has never caught a living thing, she was determined that this squirrel be her first. She was tethered, but she staked out the bottom of the tree. At first the squirrel scolded her endlessly, but after a while, it was almost like they became friends, and the squirrel would creep down the tree to taunt her. This park was big enough that I could get a good workout just riding around it. 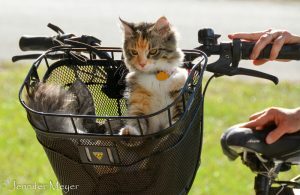 I took Bailey on a few slow rounds to get her ya-ya’s out, and Gypsy loved riding in the basket so much that she would stand by the bike and meow. One morning, though, she tried to climb up the bike to get into the basket and the bike fell over on her. She was okay, but after that, she wanted nothing to do with the bike. Maybe we’ll try again after the trauma has worn off. Most people staying in this area take advantage of the numerous theme parks in Orlando: Disneyworld, Sea World, Universal Studios, Epcot Center, and more. But we’d been to Disneyland last spring, and we weren’t interested in more $200/day outings. 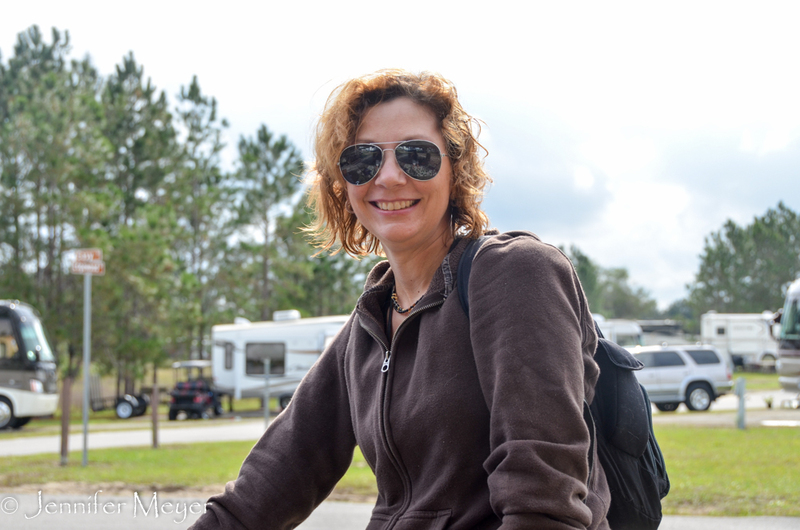 Mostly, we just stayed in the RV park and relaxed. We did have two day trips, though. One was to quaint and fancy Winter Park, just north of Orlando. The other was to Mall of Millennia to visit Santa Claus. Both were wonderful experiences. 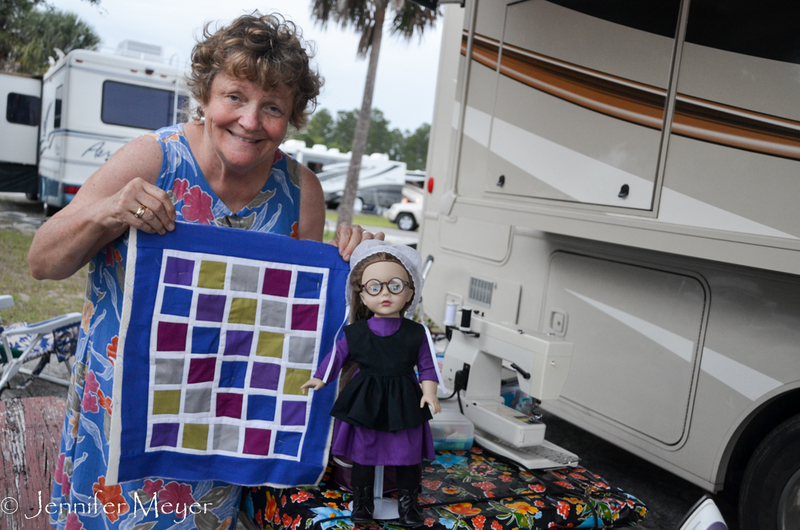 Sewing is what gives Kate joy, but she’s found that sewing in Bessie is really a challenge. She has to put up with my thinly veiled discomfort when the dinette, floor, and front seats are piled with machines, iron, and bins of material, packing stuff up each night so there’s room to eat dinner. When we settled in here for two weeks, she was happy to spread out on the picnic table outside. She still had to put everything away at night, but she didn’t have to apologize every time I tried to find a place to sit. Kate had a few things she wanted to make for Christmas presents, the biggest of which was an American Girl outfit for our seven-year-old friend, Madison. When we were in Pennsylvania, we’d seen some Amish doll outfits that were so cute, Kate decided to make her own. She took it one step further and made a doll quilt, using some of the same material she’d used to make Amish quilts for our kids decades ago, and got a kid’s book about an Amish girl. What she hadn’t counted on was the heat and the burning sun. It was in the mid to upper 80s every day. She was constantly moving the picnic table, adjusting the awning, hunkering behind the sun shade to keep from burning. Merry Christmas, Florida RV style! One evening Andrea and two of her friends got us to walk with them to a nearby neighborhood (with real houses) to check out Christmas decorations. One house at the end of the street had gone so far over the top, it was crazy. It even had a snow blowing machine. The whole neighborhood was out, in shorts and flip-flops, enjoying the winter scenery. This park was so packed with fun things to do. 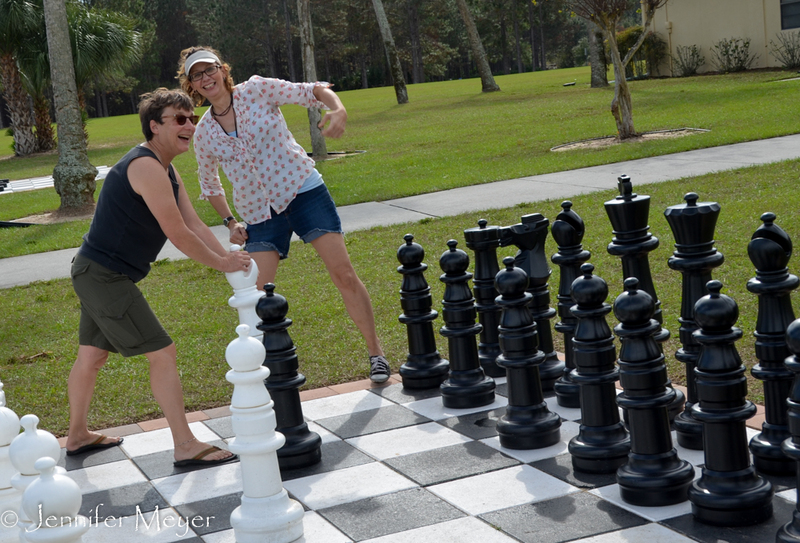 Giant chess and checker sets, pickle ball/tennis courts, mini golf, horseshoes, shuffleboard, outdoor bowling, fishing pond, and two pools. Mostly, we enjoyed the pools. It felt so good on a hot afternoon to jump in to tepid water. Once we swam at night, and I marveled at how perfectly comfortable the water felt, the air warm enough to ride out bikes back to Bessie in wet suits. There was even a good-sized lake with a fishing pier. There were paddleboats, canoes, and kayaks for free use, and it was tempting, but the alligator warnings were just too off-putting. I only saw one baby alligator a couple of times, but where there’s a baby, you can be sure there’s a mama nearby. On our last day, Andrea was up for trying out several of the games with me, and we ran from spot to spot, having so much fun I wished I’d taken advantage of all the entertainment opportunities earlier. If we end up back at this place, I’m definitely going to try pickle ball and join in one of the daily water polo games. Hi Jennifer, Kate, I just wanted to send you a Happy Holidays greeting and tell you how much I enjoy traveling through our beautiful country with you via your great posts and photos. Even though it is relatively warm here, with respect to our expectations, your spot(s) in Florida sound a bit more desirable and lead me to think your title of, “One Year, etc. ” is a flexible guess. Werner, I would love to see you again. I don’t know if we’ll make it back to St. Louis, but we might, and if so I’ll contact you. It’s so good to hear from you. Take care, and happy new year. Free kayak, but watch out for alligators? Yikes! Sounds like you are having a great break. Can’t believe how many friends you two make as you travel. You are going to have a giant Christmas card list!